I can remove bees before they become established. If they are still in a big clump, the bees are harmless. They do not like to sting when they are swarming. If you swat them or try to brush them with a broom they might sting, but generally they are busy finding a place to live and they will ignore you. A happy and successful honey bee hive will swarm. This is the way hives reproduce. The hive raises a new queen and then the successful queen heads out into the wild with a swarm of 20,000 bees to find a new place to live. It is natural. 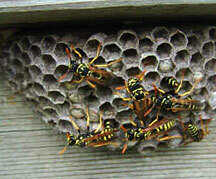 Swarms of honey bees, though, often find their new home in a house or a tree near a house where they are not welcome. It is expensive to hire an exterminator and unless they get the queen, the hive will not die. You do not want to spray your house with poisons. Why not let a beekeeper come and rescue your bees? I’ll box them up, take them away, and give them a good home. I remove honey bee SWARMS for free not established honey bee hives in a structure! If you have an established hive I can give an estimate for removal. I am not a licensed exterminator. How to tell if you have honey bees. Bees can be pests and there are lots of wild bees that sting and invade human space. Most of these are NOT honey bees. Honey bees are brown or golden brown. They have furry little bodies. They are not fat, or shiny. They do not live in the ground or make paper nests or mud nests. They do not make holes in wood. A honey bee is about 1/2 inch long. See the fur? Wasps have no fur on their bodies. Bees like hollow trees and tight places under the eaves. I work on weekdays, but I can get to your house when I get home (around 5pm) or on the weekend. I can only do bees in Rochester, NY; Monroe County, and perhaps surrounding counties as long as it is not too far.